One of our high impact After Effects templates featuring smoke and a title sequence along with 3 video frame placeholders. This After Effects project comprises 5 main titles along with 3 additional text layers. Your footage or photos are showcased in 3 video frames with lens flares that track along the edge of the video frames in 3-D space. A background of fiery smoke sets the theme for this template. 1 After Effects project version requires No Additional Plugins as the 3rd party plugins have been pre-rendered. An additional project version is included requiring the plugins listed below (Plugins Needed version). Plugins Needed: NONE: VC Optical Flares, Trapcode Particular 2.0, Starglow, and 3D Stroke elements are Pre-Rendered. The Plugins Needed version requires these plugins should you wish to modify them further. Video inserts into the frames are NOT INCLUDED. Music in the preview is NOT INCLUDED (Preview Purposes Only). It is titled “Wicked Ways 30” by Big Sound Music. From our trailer design of After Effects Templates. This design consists of a photo montage set over a smokey glossy floor. 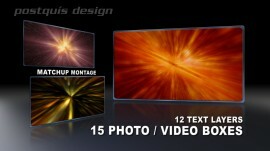 Included in this After Effects Template are 7 video/photo frames along with 5 titles. One After Effects project version requires No Additional Plugins as the 3rd party plugin elements have been pre-rendered and another Plugins Needed version requiring the plugins listed below. Plugins Needed: NONE: VC Optical Flares, Trapcode Particular 2.0, Starglow and 3D Stroke elements are Pre-Rendered. The Plugins Needed version requires these plugins should you wish to modify them further. Inserts into the video boxes are NOT INCLUDED. Music in the preview is NOT INCLUDED (Preview Purposes Only). It is titled “Harpo 30” by Big Sound Music. 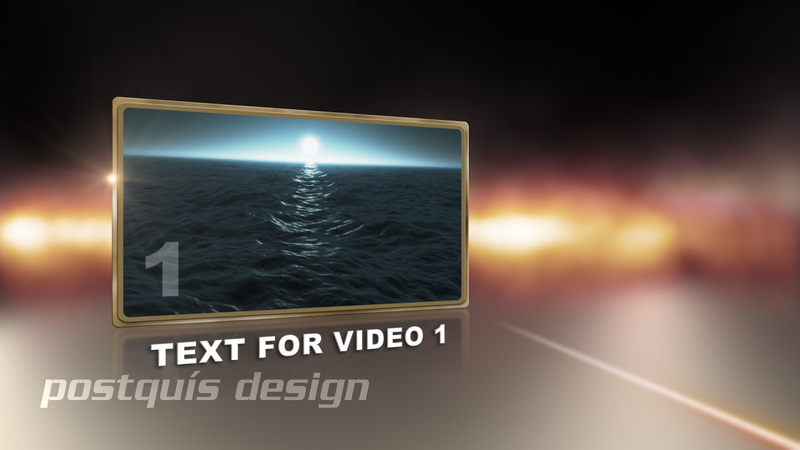 This AE template is one of our video montage template designs of After Effects Templates. It is built to showcase pairings of videos or photos and prepped with multiple layers of text which are optional if not needed. The camera animates through a series of multi-layered video boxes showcasing your material in a way which presents depth and perspective. Included are 24 video/photo boxes and 15 text layers which are set up for easy editing. Plugins Needed: NONE: VC Optical Flares are Pre-Rendered. Sky/Clouds element is a quicktime movie. 15 video boxes accommodate your photos or videos within the body of the animation along with your logo showcased both at the beginning and end. 9 additional photo/video boxes are included for the opening/closing “runway shots” for a total of 24 video/photo boxes. All boxes have reflections as they animate over a glossy floor. There are 15 text layers. Flares animate on the background horizon. This project is built at 1920×1080 HD resolution with an additional resolution of 1280×720 HD provided and has been designed as a 60 second opening/tease. If you have the required plugins all is editable with the exception of the sky/clouds movie which is pre-rendered. You could certainly change the color of the sky if needed. The “No Plugins Needed” version also includes the Optical Flare pre-rendered movies which can also be edited with color correction. You will need the plugin to fully edit the Optical Flares layers. Music in the preview is NOT INCLUDED ( Preview Purposes Only ). It is titled “Wicked Ways 60” by Big Sound Music. Should your project call for a shorter duration, be sure to preview our MatchUp Montage 1 After Effects Template. An opening title sequence from our After Effects Templates which is set over a gaseous particle animation. Multiple layered lens flares provide the transitions between the titles. The video/photo segment has lower third text animating along a path following the flowing lines (pre-rendered quicktime movies) for each video/photo. One After Effects Template is built at 1920 x 1080 and designed for the full HD screen. A second After Effects Template is designed and built at 720 x 486. This SD version is NOT a simple “side-cropped” down converted project. It has been re-designed and re-worked for the Standard Definition resolution. Pre-Render Note: The flowing lines are included as quicktime movies. Music and Sound FX are NOT INCLUDED. (for preview purposes only). The music track is titled “Moonless 60” by BIG SOUND MUSIC. Sound FX used in the preview are a custom sound design added on top of the music track. These have been added to further show how you could customize your own sound design. Various swooshes and drum hits were used for preview purposes. From our After Effects templates of movie trailer designs comes this AE intro opening template. You can insert 4 videos or photos along with multiple text options. Each video/photo frame has its own title text along with supporting titles. Utilize this After Effects template to showcase your film, TV program, corporate presentation lead-in, or product promotion. This project includes high impact visual transitions designed into the pacing and rhythm of this sequence to accent each segment. No additional plugins are required. Simply drop in your videos or photos, edit your text layers, and RENDER! Video inserts into the picture frames are NOT INCLUDED. An After Effects Template designed for movie trailer use. This After Effects Template opening title sequence animates over gaseous particles moving through a star field. Multiple lens flares accentuate the design of this template with the text dissipating back into the stars as the flares collide with the titles. 2 video/photo boxes provide an area to showcase your content. NOTE: Knoll Light Factory Pro has been used but those layers have been Pre-Rendered for you. I have included the original Knoll Light Factory Pro layers should you have this plugin and want to modify them. Trapcode Form IS REQUIRED for the text particle effect. This After Effects template project runs 30 seconds visually although the on-line preview runs longer due to allowing the final sound fx to resolve. (For Preview Purposes) Video inserts into the picture frames are NOT INCLUDED. From our After Effects templates trailer series. This intro title sequence is designed for your movie/show trailer promotion. There’s no need to worry about additional plugins as all the effects requiring third party plugins have been pre-rendered. These pre-renders and included in a ‘No Plugins Needed’ version of the template. There are 2 After Effects project files included. The ‘No Plugins Needed’ version and a ‘Plugins Needed’ version requiring the plugins listed below. This ‘Plugins Needed’ version would be used if you have the plugins listed here and wish to further customize this template. Plugins Needed: NONE: Trapcode Particlular 2.0, Starglow and Knoll Light Factory Pro are required with the Plugins Needed version of project. Music in the preview is not included (For Preview Purposes Only). It is titled “Moonless Tag” by Big Sound Music. This video montage template can save you a great deal of time when your project requires multiple sources of content in a montage design. It offers video or photo pairings with multiple layers of text and has been designed for multiple uses such as openings, teases, or a highlight package . The text layers are optional if not needed and can simply be turned off. The AE camera animates through a series of multi-layered video frames showcasing your content in a way which presents depth and perspective. No additional 3rd party plugins are required. 15 video boxes accommodate your photos or videos within the body of this After Effects template along with your logo showcased at the end. 9 additional photo/video boxes are included for the opening “runway shot” for a total of 24 boxes. All video boxes have their reflections as they animate over a glossy floor. This After Effects template could also be used for sports highlights, credit packages, as well as an intro tease. MUSIC and SFX are NOT INCLUDED. (Preview Purpose Only) All video animations used in the preview are NOT INCLUDED. This After Effects movie trailer template is designed to showcase your video highlights / photos with titles. There are 8 text layers along with 6 video/photo boxes (reflections included) set over a moonlit foggy ocean. No need to worry about additional plugins as all the effects requiring third party plugins have been pre-rendered! The ‘No Plugins Needed ‘project version includes the pre-renders featuring the Psunami generated ocean and sky. The ‘ Plugins Needed’ project version requires Red Giant Psunami 1.3, Trapcode Particular 2.0, and Knoll Light Factory Pro should you have these plugins and would like to modify the project further. Plugins Needed: None – Red Giant Psunami, Trapcode Particular 2.0, Knoll Light Factory Pro layers have been Pre-Rendered for you. You will need these plugins if you need to modify their elements. The music in this movie trailer template preview is not included (For Preview Purposes Only). It is titled “Moonless 30” by Big Sound Music.